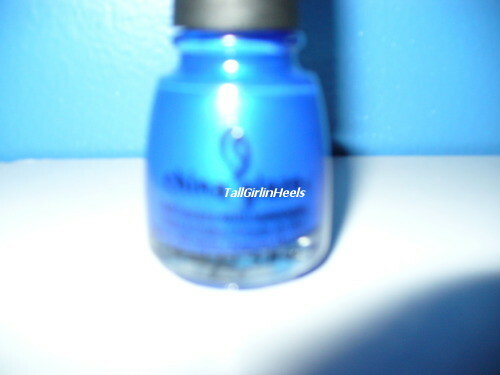 I bought cobalt shoes a month ago and I wanted a polish to match. I asked on the Facebook page and the wonderful ladies there gave me several to choose from. 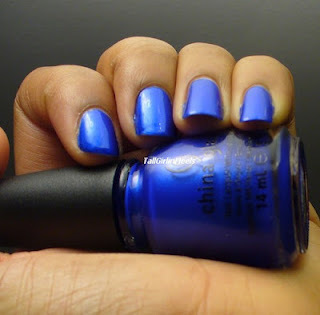 China Glaze "Frostbite" really stood out to me. 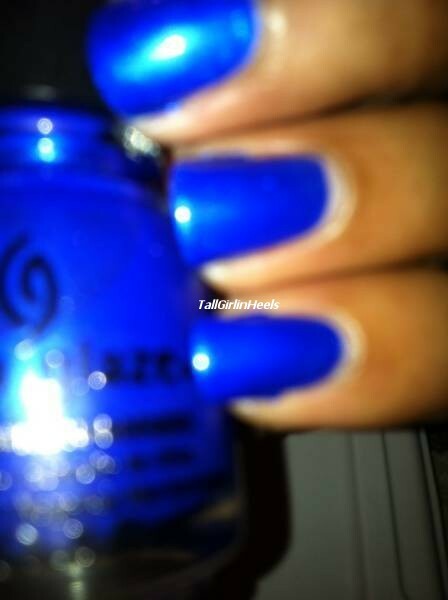 First, I'm falling in love with their lacquers. They apply so well and the colors are EVERYTHING!! "Frostbite" seems to illuminate in the dark. I don't know why, but driving last night I happened to look down at my nails and they seemed to glow and they are so pretty. I love the color. It has a hint of cobalt blue glitters in it. The glitters don't overwhelm the color they enhance it. The finish is absolutely beautiful and once I added a Seche Vite Top coat the manicure was sealed and so glossy. I'm gushing about it because I love it!! :-) Can you tell? and this is pretty close. The blue is... I love it. 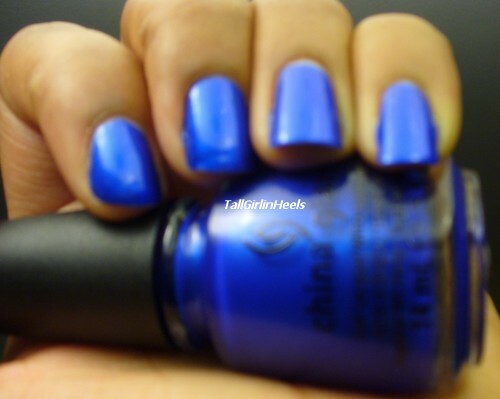 "Nivea blue." 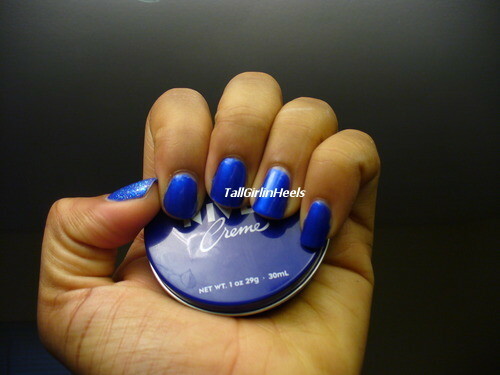 (I love this Nivea Creme). 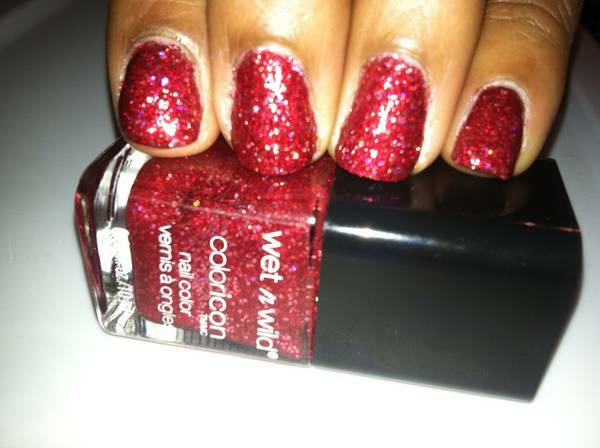 I added one accent nail of Sinful Colors "Hottie." The camera wouldn't pick up on the Greatness of this glitter. but as always I did two coats. the blue Nivea uses for it's products. 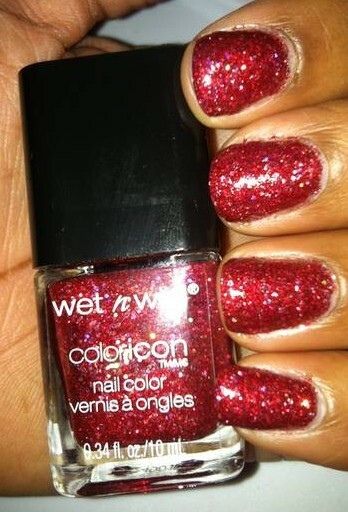 Sinful Colors "Hottie"
notch. Not that the China Glaze "Frostbite" needs it at all. I've been so into Mints polishes. I bought 3 different ones in the same day. 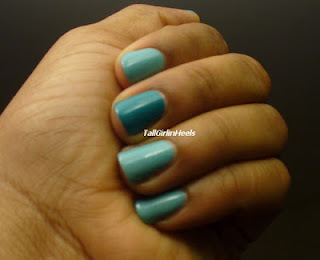 I finally decided to use Wet n Wild MegaLast "I Need a Refresh-Mint" and as always I used an accent nail. The accent nail was polished with SinfulColors "Rise and Shine." 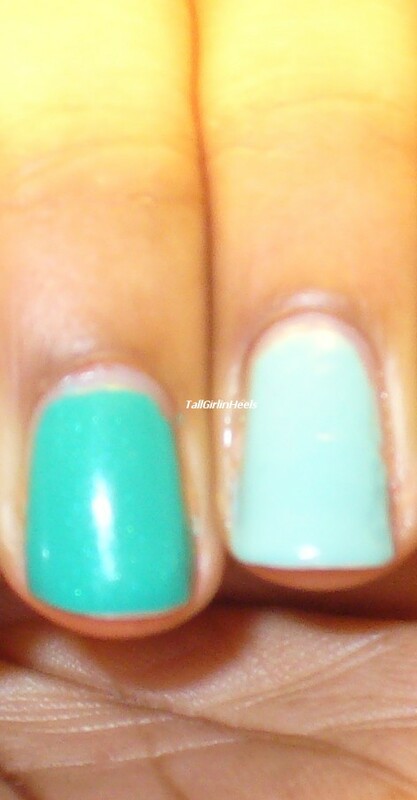 Although "Rise and Shine" isn't a mint I think it went really well as an accent nail. 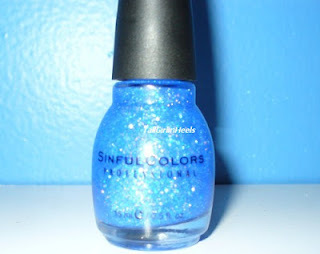 SinfulColors "Rise and Shine" has excellent coverage. This is two coats as well. 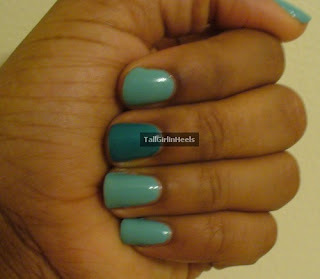 This isn't a sheer polish at all I really loved this color. I loved the combination together. So, I was telling everyone on the Facebook page that I wanted to wear my pink leggings to a party Saturday. After going through lots and lots of shirts I finally decided to go simple black with the bright pink leggings and Leopard Betsey Johnson pumps. A closer look at the rose. You have seen these before, but I don't care. I still love these shoes! What do you think? Good shoe choice or do you think I should have been less bold and went with Black boots? DSW (Designer Shoe Warehouse) I having Double points for it's rewards members 3/1/12-3/31/12. You have to choose which day you want to use it. Then you will be able to use in-store and online. If you choose to use it online the code is: FASTSHOES and/or you can print the coupon below and take to the store. If you are not a rewards member at DSW I highly recommend you become one. Even if you don't have one in your area you can order online. The program perks are great!! Just take a look at here or here for more information. They have also started a system where they will deliver outside of the US. They have International Shipping information HERE! 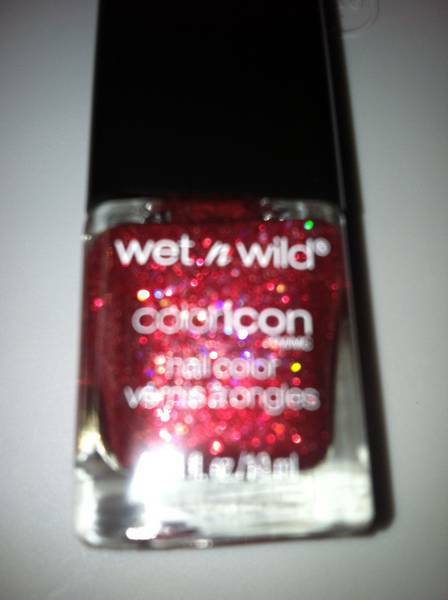 Wet n Wild ColorIcon polishes are so gorgeous! I absolutely love these polishes! I have 6: Believe Me, It's Real, 24 Carats, Back Alley Deals, Give Me A Price Quote, Diamond In The Rough & Rockin' Rubies. 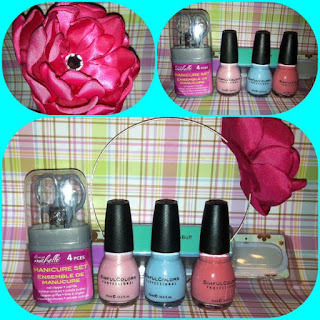 I used 2 coats in each picture and a Seche Vite top coat. 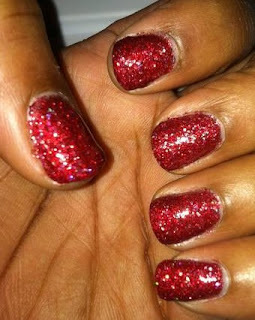 My nails were still rough to touch and I would've liked for them to be a little smoother. 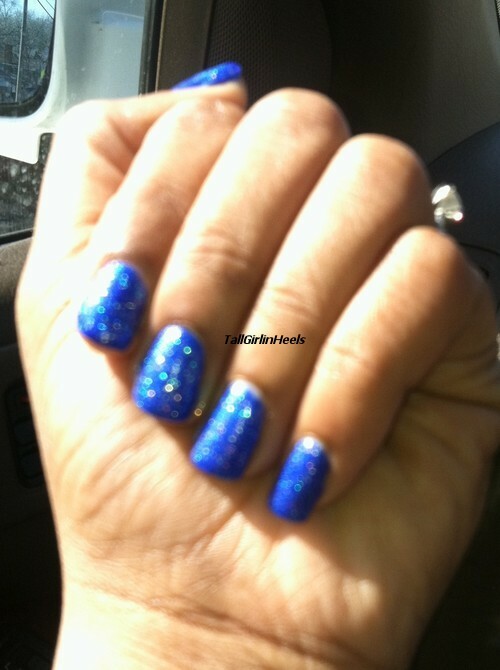 Believe Me, It's Real: Gorgeous Blue Glitter with purple accents! Love this!! 24 Carats: Beautiful Gold bar glitter with bronze bars throughout. This one could have used a 3rd coat. Back Alley Deals: purple base glitter with pink holo glitter throughout! This is my Dominant hand and it doesn't look that great. :-/ And this glitter is not forgiving. Give Me A Price Quote: least fave and a tad too thick. Diamond In The Rough: check out the rainbow colors throughout! This is a gorgeous glitter. I can't tell which is my favorite one. I like them all, however Give Me A Price Quote was my least favorite of the 6. I do think that these could be a tad thinner. They were thick and kind of hard to manage. They are gorgeous though and I will recommend getting these if you can find them in your area. If you haven't taken advantage of the EARLYACCESS deal from DSW it is set to expire 2/23!! I have reached 500 Fans!! Well now I'm at 662. I'm so happy that you all have come over and join me on Tall Girl In Heels. I discuss nail polish and shoes and even how to get those things budget friendly. If you ever have any suggestions, comments or complaints please feel free to contact me at Tallgirlinheels@gmail.com, leave a comment here or on the Facebook wall. 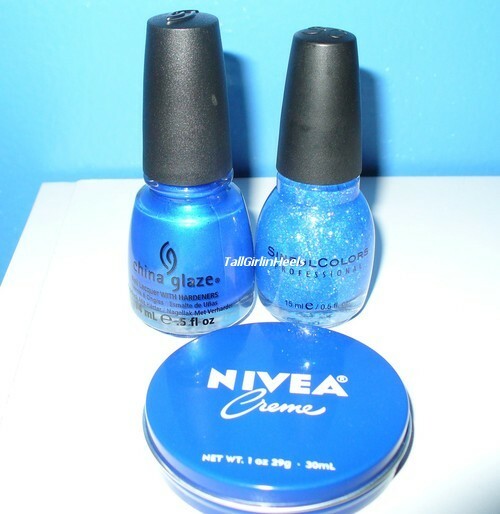 I wanted to do a "girlie" giveaway, but then I decided to throw in something blue :-). The giveaway will be open now until 2/22/12 11:59 pm. I will announce the winner on Thursday 2/23/12 in the morning. I also, was given a donation from a very good friend of mine from Cutique Designs. She makes everything by hand and all of her products are wonderful. The link above takes you to her website or you can click here to visit her Facebook page. This picture shows the Red, Purple, yellow, green and even pink holographic glitter. This was perfect for Valentine's day! I'm not really a pink girl so Red works for me. The name Rockin' Rubies works! It's definitely Rockin' and so shiny and sparkly! I absolutely LOVE this color. My Husband loved it too. We decided it'll be perfect for Today! Happy Valentine's Day everyone!! I'll have another post with the other Wet n Wild ColorIcon polishes I picked up. In depth review about the "chunkiness" and so on. Have you heard of Extracare bucks? This is a program at CVS at basically rewards shoppers for buying certain products. This can be very beneficial you is as a consumer. Go into CVS and sign up for an ExtarCare card. CVS has a big red machine that prints out coupons when you scan your card. Be sure to scan this card until you see a a message that states "no more coupons check back tomorrow". Sometimes you will receive some great coupons and sometimes not so great. Join CVS' beauty club. For every $50 you spend on beauty products you will receive $5 ECB!! This is the part that is so great for us polish lovers! You can go into CVS pick up polish and earn money for doing your regular shopping. Doesn't that sound exciting? I think so. Also, CVS sends emails out stating 20% off a certain $$ amount, $4 off $20 purchase, $5 off $30 purchase and so on. These are great to have, too because you can use these with your ECBs and any other coupons you have. Then you will pay out of pocket (OOP) anything your coupons and ECBs doesn't cover. Does this make sense? Let me know if it doesn't by leaving a comment or by emailing me tallgirlinheels@gmail.com. I will try to explain it to you further. Also, if you have anything to add please do so! Thanks for reading. Please follow the blog! !